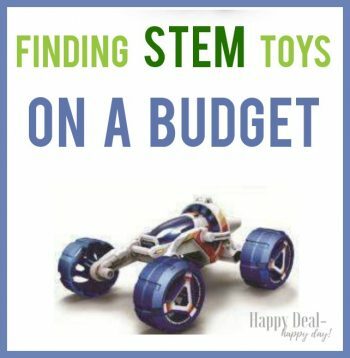 Tips For Finding STEM Toys On A Budget | Happy Deal - Happy Day! Those that are regular readers here know that I’m a former high school science teacher and that my husband is an engineer. That makes for a great team of parents who love it when their kids play with STEM toys! That’s why I invited Annie Grace Wilson from The STEM Store to share with us some tips on how to find these educational toys without spending a fortune! STEM toys have a number of benefits. These toys are geared towards children who have an interest in technology that help them simultaneously play and learn. STEM toys help children develop their creativity and enhance their problem solving skills. You may think that science, math, engineering and technology based toys are all expensive – but that isn’t true! There are several ways to find inexpensive STEM toys or ways to save money on STEM toys so that all kids can have access to these educational tools. The first place I recommend when shopping for STEM toys is to checkout out Amazon Warehouse. It works the same way that regular Amazon works, however the prices are a lot lower because those products have been returned, used, damaged or refurbished. You may not like the idea of buying a toy that someone has used before, but there is no need to worry about purchasing a secondhand toy. Every toy is graded and deemed suitable before it is sold. You really do not have anything to lose by buying from Amazon. If you do not like the toy, then you can return it. Many people are hesitant to buy a toy secondhand. However, if a toy is good-quality, then it can last for many years. Children quickly lose interest in toys, which is why they are often given away. You can find second hand toys on places like Gumtree, Craigslist and eBay. You can also find second hand toys from garage sales and flea markets. Children typically do not care if a toy is secondhand. The most important thing is to choose a clean toy that works. Contrary to popular belief, Black Friday is not the only time that you can bring home an amazing deal. There are sales that go on during various times of the year, especially clearance sales after a holiday has occurred. There are also seasonal sales. It is a good idea to go to several stores and comparison shop in order to ensure that you get the best deals. And keep in mind that you can shop for birthdays and Christmas all year long by hitting up these sales, and storing the toys for the actual event. You can purchase STEM toys on smaller educational sites. One of the websites that you may want to consider using is the The STEM Store. You will be able to get a variety of fun STEM toys for a good price. Especially checkout their under $20 category! You can save a lot of money on STEM toys by using online coupons. You can sign up for websites like RetailMenot and Dealspotr. 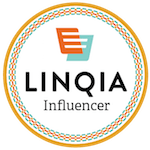 You will be able to use codes that you can use in your virtual shopping sites. Not only can you save money, but you may also be able to get free shipping. Groupon is another website that you can use to save money. You may be able to save anywhere from 50 to 90 percent by using Groupon. This can either be for Groupon Goods or a fun kid activity that you will get a voucher for in your e-mail. 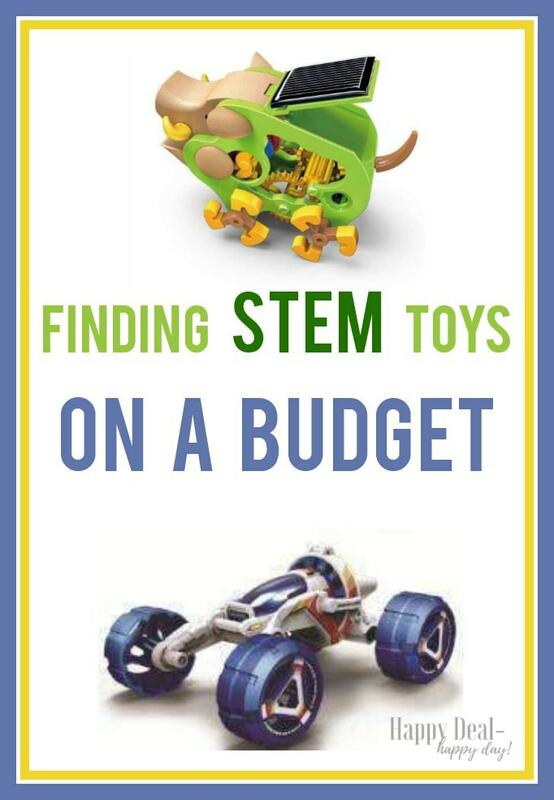 So get some STEM toys in your home – they are educational, fun, and you don’t need to spend as much as you might think you would! Author Bio: Annie Grace Wilson is a Public Relations Specialist for The STEM Store. She regularly produces content for a variety of blogs that cover topics on STEM toys and fun educational material.